Eager for a creative outlet for my interests in design and color, I began FarmGirl Framing in 2001. At that point, 15 years of experience framing items for myself, friends and family and many hours of training through a leading industry educational program gave me the experience and expertise to provide customers with appropriate methods of framing and mounting art and treasures for the home or office. I pursued continuing education in framing and matting through the Smithsonian Residents Program. Attending yearly art and framing trade shows keeps me current in best practices for framing techniques and methods, design trends, and enables me to source the newest framing products. The matting and framing of your art is critical to its effect. 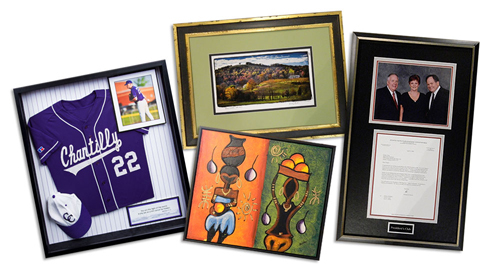 As individualistic as your art choices are, so are your framing and matting choices. Leaving them to a cookie-cutter craft store or strip mall framers results in a fast food-type of experience. What distinguishes FarmGirl Framing from others is the individualized attention I provide. I meet with you at your convenience in my studio. There’s never a wait. I see only one customer at a time and you receive my full attention. Sometimes a home visit is helpful to make sure the choices will fit well with your décor. My home-based setting is a relaxing, comfortable environment where you can take your time to make your best design choices. I welcome you to borrow frame and mat samples so that you can see how they look in your personal surroundings. I offer in-home consultations and delivery. Turn around time is typically about a week to 10 days, and I can often accommodate rush jobs. This degree of personalized service is not available at businesses that regularly advertise 50% off already inflated prices. When you purchase custom framing from FarmGirl Framing you are not only acquiring a frame. You benefit from my design skills, trained eye and experience. Akin to custom-made furniture and one-of-a-kind window treatments, I design and construct each frame and mat one at a time, handcrafting them to your specifications.